If your roof is starting to show some signs of severe roofing damage or deterioration, you should contact an expert roofer here in Austin, TX to conduct a roof inspection. A professional roofing contractor can easily evaluate your roofing system and advise the most efficient roofing solution, including a roof replacement process. 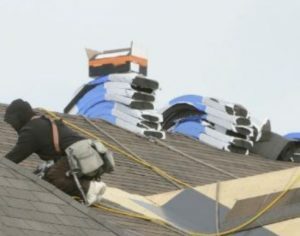 When it comes to Austin, TX roofing concerns, particularly involving a roof replacement, homeowners and business owners turn to Dustin Johnson Exteriors & Roofing for help. We have been in the roofing industry for more than two decades now, and we managed to handle various roofing projects both for residential and commercial properties here in Austin, TX. With over 20 years of experience, we have managed to improve our services as well as the roofing materials and equipment we use to serve you best. When we perform a roof replacement for your property, we always see to it that we deliver the best quality roofing services and materials. In order to do so, we always provide our Austin roofers and project managers with the latest roofing equipment for a prompt, efficient, and seamless roofing service. To complement the materials and equipment we utilize, we also provide our personnel with up-skill trainings to enhance their skills and specialized roofing knowledge, allowing them to be on top of every procedure involved in a roof replacement project here in Austin, Texas. Check What Others Are Saying About Our Services! Similar to any other undertaking, careful planning, meeting, and constant communication is always observed by our team of roofers and project managers when performing any roofing project. When it comes to a roof replacement, whether a partial or complete roof replacement, we always see to it that our processes and standards are consistently followed. And some of these processes are highlighted below. Pre-Construction Meeting: Since we work as a team for the success of any roofing project, we always conduct a pre-construction meeting in order to confirm the necessary elements and processes needed during and even after the actual roof replacement process. Acquire Building Permits: As a sign of our professional integrity and obedience to the law, Dustin Johnson Exteriors & Roofing always see to it that the necessary requirement and permits are obtained. Hence, meeting all the local building codes, while preventing unnecessary expenses for corrective construction of your roof. Check Delivery of Materials: Since we want to do things right at the first try, we always make sure that the materials delivered are the ones you have requested. This will allow our team of roofers to start and proceed on the roof replacement schedule. Confirm Weather Forecast: We always see to it that we are on top of potential weather disturbances that may cause water damage during the construction phase. Hence, allowing us to make the necessary adjustments and arriving at the best time for roof replacement. If you desire the best quality roof replacement result for your property, you should contact Dustin Johnson Exteriors & Roofing today. Call us at (512) 337-2661 to know more of our services, or visit us at 901 S MoPac, Expy building 1, #300, Austin, TX 78746 for a personal consultation. You may also follow us on our Dustin Johnson Exteriors & Roofing Facebook Page, Dustin Johnson Exteriors & Roofing Twitter & Dustin Johnson Exteriors & Roofing Instagram Accounts. Contact us today! With over 23 years experience making homes beautiful in Austin, TX, Dustin Johnson Exteriors & Roofing is your number one choice for all things home improvement! We offer top notch, warrantied roofing, siding, windows, and gutter systems for your home. Financing is available for qualified customers. Call today for your free quote on your project!